This is a dummy coloring book, made up of entirely blank pages. 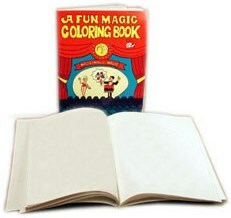 Use it as a finish for the world famous Fun Magic Coloring book. Switch in this blank book at the end of your performance. Now the book can be examined. There's nothing to find! Buy the best. Buy the original. Buy Royal. Proudly made in the USA by FUN Incorporated.